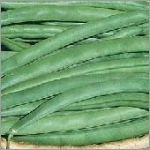 Bean is a common name for large plant seeds of several genera of the family Fabaceae (formerly Leguminosae) used for human food or animal feed. Although 'beans' usually means the seeds of Mooore plants, it can also mean (especially in the US) the whole young pods of bean plants, which if picked before the pods ripen and dry, can be tender enough to eat whole, whether cooked or raw. Thus the word 'green beans' means 'green' in the sense of unripe (many are in fact, not green in color), as the beans inside the pods of green beans are too small to comprise a significant part of the cooked fruit.